Details about HP DesignJet 500 24" colour plotter c/w stand FREE DELIVERY! 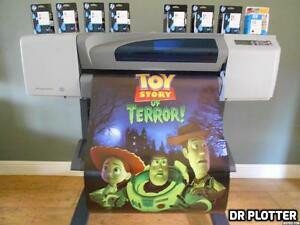 HP DesignJet 500 24" colour plotter c/w stand FREE DELIVERY! This is a great product, the print drivers are in most windows set up so you dont need to down load them , its easy to use easy to load the paper on rolls or plain sheets and then just follow the instructions on the control panel. It is masive so dont think you can tuck in a tight corner.Beware I printed an A1 photo of Julie my partner and our daughter its realy great but now I have lots of requests for A1 photos.I bought it to print A1 drawing for work and it does this briliantly it quite slow however speed is not a problem for me. price for price and for the quality you cant go wrong. Its very well made and solid and reliable.